A fun, busy, enjoyable and educational few days last week, as I joined Rob Buckland, Matt Dunn, Ruth Bourne and Gilly Blair to tutor on the Manchester Single Reed summer school. Sessions included a massed clarinet / saxophone choir, chamber music, technique classes, a klezmer class and an end-of-course concert for friends and family. Well done to all those who took part with such enthusiasm and energy! Between June and July I’ll be involved in an interesting and ambitious project lead by music leader Sarah Atter, in conjunction with the Bridgewater Hall and Metrolink, called “Tram Tracks”. Sarah’s inspiration was to celebrate 25 years of trams in Manchester by recruiting musicians to work with various community groups across Greater Manchester to write a song for each of the 93 stops on the network – no small task! I’m pleased to be working with St Michael’s Primary school in Whitefield and the volunteer group at Ordsall Hall, Salford. There is going to be a gala performance of the songs at the Bridgewater Hall on 9th July, and they will be available to listen to online afterwards too so I’ll post what we come up with! 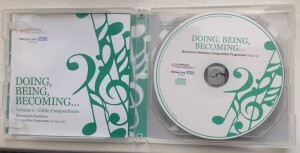 December 8th was a special day for me, as Georgina Aasgaard and I finally got the chance to present copies of a CD “Doing, Being, Becoming” to patients at Ashworth Hospital. We had been working for several months with a dedicated and motivated group of patients as part of Ashworth’s Recovery College initiative, delivered through Liverpool Philharmonic’s Mersey Care Musician in Residence programme. The group had chosen to study Celtic music and over our weekly visits, Georgina and I had a lot of fun performing jigs and reels, as well as helping the patients to write their own Celtic-inspired compositions. We were then able to take away the patients’ work and professionally record 15 tracks at The Friary, Liverpool, with the help of guitarist Rob, and Mark on drums and whistles. The finished product is a great testament to what was achieved during this project, and the presentation event was quite an emotional one! Special thanks to Robin and Sam at Ashworth, without whose support the project could never have happened.